In 2008 the Conference Board research group surveyed American workers and found that more than half were unhappy in their jobs. Workers are dissatisfied with their jobs for a variety of reasons: Many workers don't like their long commute to work, they don't like their co-workers, they don't find their job interesting, they don't feel that they have job security, they don't have opportunities for advancement. However, tens of thousands of individuals have escaped the corporate world to make a better life for themslves. 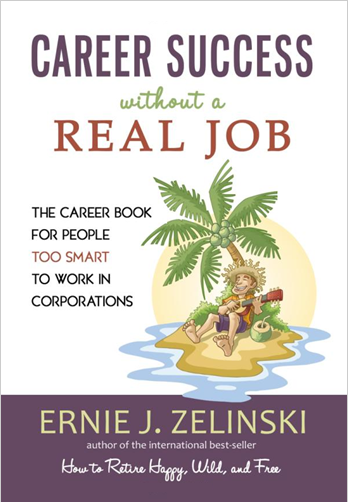 In his popular book Career Success without a Real Job, Ernie J. Zelinski gives you a guide to success outside the corporate rat race and to finding one's ideal dream job. 1. Choose work that you truly enjoy. 2. Choose an area that allows you great freedom. 3. Don't make your main purpose earning a lot of money..
4. Create an unreal job or start an unconventional business. 5. Choose an area that you can expand to multiple streams of income. 6. Identify your target markets and serve them well. 7. Be creative, particularly in generating new ideas and in marketing your products and services. 8. Spend big bucks on your career development and leqarn from the best in your field. 9. Contract out anything that you dislike or are not good at. 10. Work as hard as you have to for a good living - and as little as you can get away with! • Create your own dream job or operate an unconventional business. • Find your own important mission, true calling, or passionate pursuit with which you can make a great living. • Gain courage to escape the corporate world so that you don't have to spend the rest of your life trapped in a cubicle. • Be creative and have fun in your work. • Restructure your life so that it has meaning, direction, and joy. • Take charge of your physical, emotional, financial, and spiritual well-being. • Experience true personal freedom in all areas of your life. • Above all, get the most out of your life - personally and professionally! This revolutionary career book is for those millions of organizationally averse people who would like to break free of corporate life so that they have complete control over their lives. Throughout the book you will read about several ordinary individuals who have attained extraordinary success without a real job. Sallie Burns of Highlands Ranch, CO saya, "My husband read your book and enjoyed the ideas put forth about working in a job that creates satisfaction and enjoyment. Steve worked for 35 years in sales which gave him the freedom to create his own business system to make sales. We have paid off our home and have a nest egg to retire on without having to go through the drudgery of working for a corporation that we hated. Ernie has written a book that outlines how to do this in a fun way. Click here for more information.